The Skills Show is the “future of our country” that will help bridge a growing skills gap with world-class apprenticeships, Robert Halfon has said. The apprenticeship and skills minister (pictured right) visited the fourth annual Skills Show this morning as the three-day event at Birmingham’s NEC kicked off. 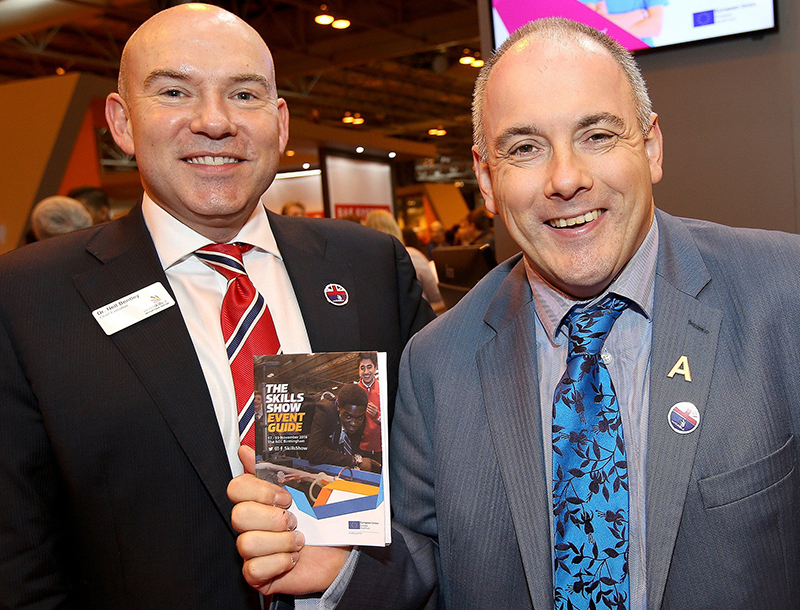 Standing alongside Neil Bentley (pictured left), chief executive of WorldSkills UK – the organisation that runs the Skills Show, he said it was “one of the most important days in the skills calendar” that encompassed the very people that would help address the country’s skills deficit. “There is a skills deficit – but we are acknowledging that and doing everything we can to improve it,” the minister said. “It’s incredibly important to support days like this [the Skills Show] ….we are going to become an apprentice and skills nation – that is my dream. “We must have the best skills in this country to compete with the rest of the World. This year’s Skills Show is expected to be the biggest yet with more than 90,000 people walking through the NEC’s doors over the next three days. The show has 530 apprentices and learners taking part in 61 different skills competitions, 50 hands-on activities, and careers advice from employers including Jaguar Land Rover, NHS Careers, IBM and the BBC. Mr Halfon said of the show: “It is incredible. This is one of the most important days in the skills calendar. “There is the best of Britain in this room. “We’ve got hundreds of companies here, the public sector, skills competitors and people demonstrating skills. This is the best of the UK – this is the future of our country right here. “You can hardly get in due the number of young children and students here – seeing what’s on offer. Read our full preview for what else visitors can expect at this year’s Skills Show here.